The entry was reconfigured to create a clear procession, which did not exist before. 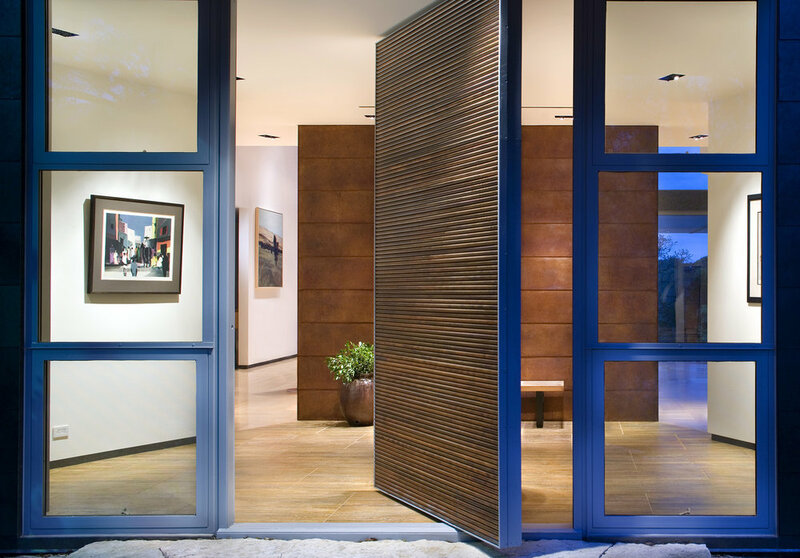 A large pivot door clad in copper tubing welcomes visitors, while a natural stone path integrates the xeriscaping of the garden with the new entry. 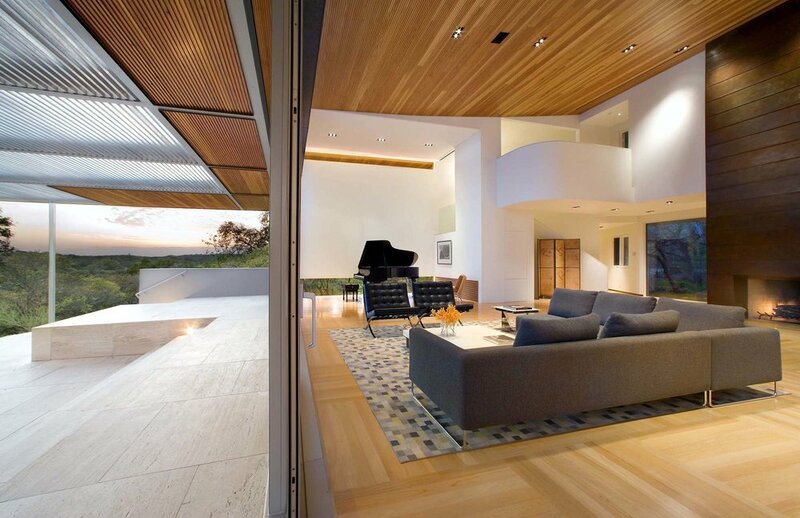 The Great Room was expanded in volume to establish a clear hierarchy of spaces in the house. This large room serves as a hub for the entire house, with all the functions of the house revolving around it: to the north the entry; to the south the terrace; to the west the bedrooms; and to the east the kitchen, garage, and home offices. The Great Room is used for parties, piano recitals, formal dinners, and the family’s everyday activities. The terrace and trellis were designed to unify the house and garden. Located five feet lower than the main level of the house, the existing pool was visually disconnected from the residence. The new design replaces the wood deck with a large travertine terrace at an intermediate level between the main house and the pool. The terrace meets the Great Room with wide, generous steps that can serve as seating areas during large gatherings, and extends south to the edge of the pool and eastward to connect with the garden. 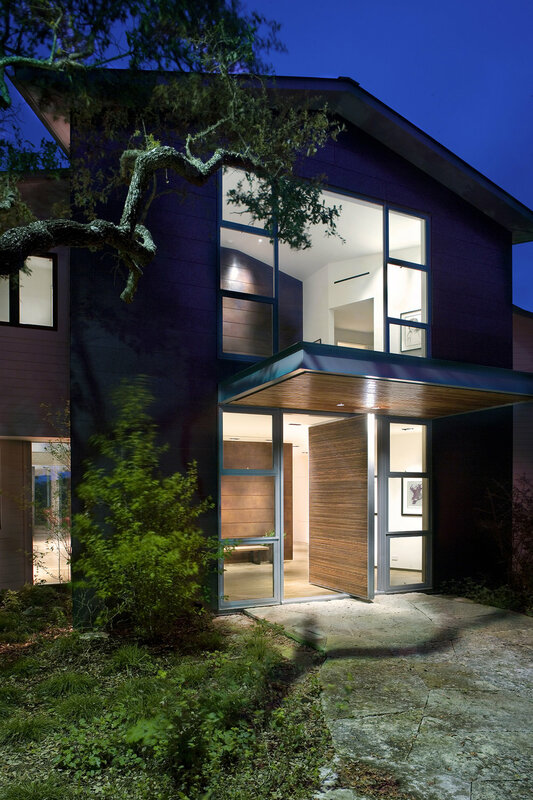 To make the terrace usable in the long, hot Texas summers, an aluminum trellis designed to accommodate two existing trees covers the space.